ROCKVILLE, Md., Aug. 18 — Armstead Taylor and John Alfred Brown, negroes, were hanged here this morning for the murder of Mr. and Mrs. Rosenstein at Slidelle in March last. The drop fell at 10:15[?]. The hanging was a horrible botch. the knot did not slip but the drop was long enough. The men writhed, groaned and uttered inarticualate [sic] sounds for nearly ten minutes. The murders for which they were convicted and sentenced to be hanged were committed at Slidelle, a little station two miles north of Boyds, Md. on March 13 last. Louis Rosenstein, the postmaster of the hamlet[,] lived with his aged parents in the rear of the post office. They were said to have plenty of money. Early one morning they were attacked and the man’s skull was crushed and the woman’s head pounded with some blunt instrument. The store was ransacked and a little over $3,000, a pair of shoes and several articles were taken. Louis Rosenstein died the day after of his injuries and Mrs. Rosenstein lingered until May when she succumbed in a hospital at Baltimore. Taylor went to Washington and soon attracted attention by spending money in a lavish manner in Georgetown. Suspicious neighbors gave the police the information that led to his capture. Before Taylor was arrested, however, Sergeant Fritz Bassau of the Washington police force gave up his life. Taylor shot him down as he was climbing the stairs to arrest him, where he was concealed in the house at Georgetown. He also shot Officer Gowon in the hand. 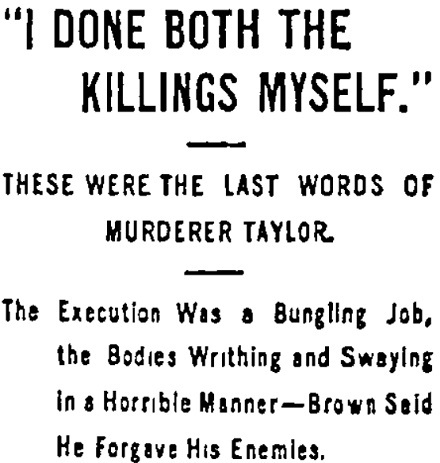 Taylor was taken back to Montgomery county, but did not stand trial for injuring the policemen. His trial was begun at Frederick on July [?] and Brown’s a week later. Both were convicted and sentenced to be hanged August 18. Strong efforts were made to have Brown respited, it being believed by many that he was only an accessory after the fact. Gentlemen, I done both the killings myself. My Uncle Brown is not guilty. I am the guilty man, but I expect to go to heaven. Brown refused to make any statement beyond that he had forgiven his enemies and had found salvation. The deputies then adjusted the rope, before placing the black caps on their heads. Both men smiled and Brown said good-bye to some friends in the crowd who spoke to him. Sheriff Thompson tok [sic] a board about six feet in length, walked over to the side of the scaffold, reached down and inserted the end of a plank in the wire ring and sprung the trap. The bodies fell through simultaneously and began to writhe and sway in a horrible manner. Taylor seemed to be conscious and appeared to be trying to speak. The priests pronounced it the most horrible execution they had ever seen.